The development of modern isotope geochemistry is without doubt attributed to the efforts, begun in the 1930's and 1940's, of Harold Urey (Columbia University and the University of Chicago) and Alfred O.C. Nier (University of Minnesota). Urey provided the ideas, theoretical foundation, the drive, and the enthusiasm, but none of this would have made a major impact on Earth Sciences without the marvelous instrument developed by Nier and later modified and improved upon by Urey, Epstein, McKinney, and McCrea at the University of Chicago. Harold Urey's interest in isotope chemistry goes back to the late 1920's when he and I.I. Rabi returned from Europe and established themselves at Columbia to introduce the then brand-new concepts of quantum mechanics to students in the United States. Urey, of course, rapidly made an impact with his discovery of deuterium in 1932, the 'magical' year in which the neutron and positron were also discovered. Urey followed up his initial important discovery with many other experimental and theoretical contributions to isotope chemistry. During this period, Al Nier developed the most sophisticated mass spectrometer then available anywhere in the world, and made a series of surveys of the isotopic ratios of as many elements as he could. Through these studies, which were carried out mainly to obtain accurate atomic weights of the various elements, Nier and his co-workers clearly demonstrated that there were some fairly large variations in the isotopic ratios of the lighter elements. 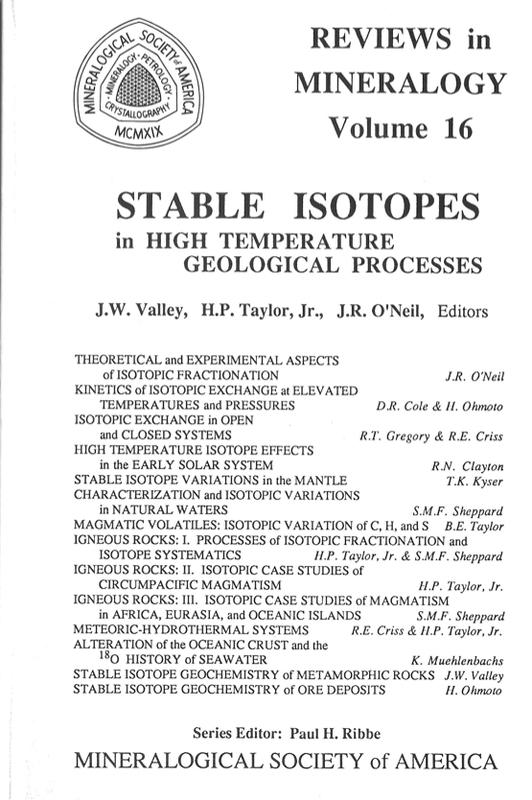 However, the first inkling of a true application to the Earth Sciences didn't come until 1946 when Urey presented his Royal Society of London lecture on 'The Thermodynamic Properties of Isotopic Substances' (now a classic paper referenced in most of the published papers on stable isotope geochemistry). With the information discovered by Nier and his co-workers that limestones were about 3 percent richer in 18O than ocean water, and with his calculations of the temperature coefficient for the isotope exchange reaction between CaCO3 and H2O, Urey realized that it might be possible to apply these concepts to determining the paleotemperatures of the oceans. Urey was never one to overlook important scientific problems, regardless of the field of scientific inquiry involved. In fact, he always admonished his students to 'work only on truly important problems!' Urey, then a Professor at the University of Chicago, decided to take a hard look into the experimental problems of developing an oxygen isotope paleotemperature scale. Although the necessary accuracy had not yet been attained, the design of the Nier instrument seemed to offer a good possibility, with suitable modifications, of making the kinds of precise measurements necessary for a sufficiently accurate determination of the 18O/16O ratios of both CaCO3 (limestone) and ocean water. Enormous efforts would be required to do this, because even if all the mass spectrometric problems could be solved, every analytical and experimental procedure would have to be invented from scratch, including the experimental calibration of the temperature coefficient of the equilibrium fractionation factor between calcite and water at low temperatures. To carry out this formidable study, Urey gathered around himself a remarkable group of students, postdoctoral fellows, and technicians, as well as his paleontologist colleague Heinz Lowenstam. With Sam Epstein at the center of the effort and acting as the principal driving force, the rest, as they say, 'is history.' The marvelous nature of the Nier-Urey mass spectrometer is attested to by the fact that the basic design is still being used, and that there are now hundreds of laboratories throughout the world where this kind of work is being done. For example, the original instrument built by Sam Epstein and Chuck McKinney at Caltech in 1953 is still in use and has to date produced more than 90,000 analyses. University, government, and industrial laboratories have found these instruments to be an indispensable tool. Enormous and widely varying application of the original concepts have been made throughout the whole panoply of Earth, Atmospheric, and Planetary Sciences. In the present volume we concentrate on an important sub-field of this effort. That particular sub-field was inaugurated in Urey's laboratories at Chicago by Peter Baertschi and Sol Silverman, who developed the fluorination technique for extracting oxygen from silicate rocks and minerals. This technique was later refined and improved in the late 1950's by Sam Epstein, Hugh Taylor, Bob Clayton, and Toshiko Mayeda, and has become the prime analytical method for studying the oxygen isotope composition of rocks and minerals. The original concepts and potentialities of high-temperature oxygen isotope geochemistry were developed by Samuel Epstein and his first student, Bob Clayton. Also, Bob Clayton, A.E.J. Engel, and Sam Epstein carried out the first application of these techniques to the study of ore deposits. The first useful experimental calibrations of the high-temperature oxygen isotope geothermometers quartz-calcite-magnetite-H2O were carried out initially by Bob Clayton, and later with his first student Jim O'Neil. In the meantime, Sam Epstein and his second student, Hugh Taylor, had begun a systematic study of 18O/16O variations in igneous and metamorphic rocks, and were the first to point out the regular order of 18O/16O fractionations among coexisting minerals, as well as their potential use as geochemical tracers of petrologic processes. During this period, a parallel development of sulfur isotope geochemistry was being carried out by Harry Thode and his group at McMaster University in Canada. They developed all the mass spectrometric and extraction techniques for this element, and also provided the theoretical and experimental foundation for understanding the equilibrium and kinetic isotope chemistry of sulfur. Starting from these beginnings, most of which took place either at the University of Chicago, Caltech, or McMaster University (but also with important input from Irving Friedman's laboratory at the U.S. Geological Survey, from Athol Rafter's laboratory in New Zealand, and from Columbia, Penn State, and the Vernadsky Institute in Moscow), there followed during the decades of the late 60's, 70's, and early 80's the development and maturing of the sub-field of high-temperature stable isotope geochemistry. This discipline is now recognized as an indispensable adjunct to all studies of igneous and metamorphic rocks and meteorites, particularly in cases where fluid-rock interactions are a major focus of the study. The twin sciences of ore deposits and the study of hydrothermal systems, both largely concerned with such fluid-rock interactions, have been profoundly and completely transformed. Virtually no issue of Economic Geology now appears without 3 or 4 papers dealing with stable isotope variations. No one writes papers on the development of the hydrosphere, hydrothermal alteration, ore deposits, melt-fluid-solid interactions, etc. without taking into account the ideas and concepts of stable isotope geochemistry. Although the present volume represents only a first effort to fill the need for a general survey of this sub-field for students and for workers in other disciplines, and although it is still obviously not completely comprehensive, it should give the interested student an idea of the present 'state-of-the-art' in the field. It should also provide an entry into the pertinent literature, as well as some understanding of the basic concepts and potential applications. Some thought went into the arrangement and choice of chapters for this volume. The first three chapters focus on the theory and experimental data base for equilibrium, disequilibrium, and kinetics of stable isotope exchange reactions among geologically important minerals and fluids. The fourth chapter discusses the primordial oxygen isotope variations in the solar system prior to formation of the Earth, along with a discussion of isotopic anomalies in meteorites. The fifth chapter discusses isotopic variations in the Earth's mantle and the sixth chapter reviews the variations in the isotopic compositions of natural waters on our planet. In Chapters 7, 8, 9 and 10, these isotopic constraints and concepts are applied to various facets of the origin and evolution of igneous rocks, bringing in much material on radiogenic isotopes as well, because these problems require a multi-dimensional attack for their solution. In Chapters 11 and 12, the problems of hydrothermal alteration by meteoric waters and ocean water are considered, together with discussions of the physics and chemistry of hydrothermal systems and the 18O/16O history of ocean water. Finally, in Chapters 13 and 14, these concepts are applied to problems of metamorphic petrology and ore deposits, particularly with respect to the origins of the fluids involved in those processes. It seems clear to us (the editors) that this sub-field of stable isotope geochemistry can only grow and become even more pertinent and dominant in the future. One of the most fruitful areas to pursue is the development of microanalytical techniques so that isotopic analyses can be accurately determined on ever smaller and smaller samples. Such techniques would open up vast new territories for exploitation in every aspect of stable isotope geochemistry. Exciting new methods have recently been developed whereby a few micromoles of CO2 and SO2 can be liberated for isotopic analyses from polished sections of carbonates and sulfides by laser impact. There are also new developments in mass spectrometry like RIMS (resonance ionization mass spectrometry), Fourier transform mass spectrometry and the ion microprobe that offer considerable promise for these purposes. Stable isotope analyses of large-sized samples (even those that must be obtained by reactions of silicates with fluorinating reagents) have now become so routine and so rapid that they represent an 'easy' way to gather a lot of data in a hurry. In fact 'mass production' techniques for rapidly processing samples are starting to become prevalent, so much so that one of the biggest worries in the future may be that a flood of data will overwhelm us and outstrip our abilities to carefully define and carry out sampling strategies, as well as to think carefully and in depth about the data. An organized system of handling the D/H, 13C/12C, 15N/14N, 18O/16O, and 34S/32S data, and/or a computerized data base that could be manipulated and added to would be a useful path to follow in the future, particularly if it were integrated into a larger data base containing radiogenic isotope data, major- and trace-element analyses, electron microprobe data, x-ray crystallographic data, and petrographic data (particularly modal data on mineral abundances in the rocks).